PT Pertamina EP - PEP or later known as Pertamina EP is an upstream subsidiary company of state-owned energy giant PT Pertamina (Persero). PT Pertamina EP involved in exploration, exploitation operations, sale of oil and gas production resulted from exploitation activities. As of December 2016, PT Pertamina EP is 99.99% owned by PT Pertamina (Persero) and 0.01% by PT Pertamina Dana Ventura. Based in Jakarta, Pertamina EP now has total working area under production sharing contracts (PSCs) of approximately 113,613.90 km2. Pertamina EP running its business through 21 field, 6 development projects, and 7 utilization areas. According to PT Pertamina EP Annual Report 2016 as cited by JobsCDC.com, Pertamina EP reported total operating revenues from Crude Oil, Natural Gas and Liquefied Petroleum Gas (LPG) of USD 2,495 million in 2016. This reflected a 14.67% decrease from USD 2,924 million in 2015. Total comprehensive profit in 2016 was down 17.19% at USD 602 million from USD 727 million in 2015. Background in Bachelor Degree (S1), preferably Master Degree (S2). Minimum 5 years of experience in planning, risk management, internal control / Audit, or business development. Previous experience in oil and gas or management consulting. Possess certification in risk management is preferred. Have a good knowledge about strategic management, portfolio, budget and forecasting as well as oil and gas practice fundamental. Have a good communication and able to work in a team. Background in Bachelor Degree (S1) in Engineering : Petroleum Engineering, Mining Engineering, Geology Engineering, Chemical Engineering, Electricity Engineering, Mechanical Engineering. Have a good knowledge and strong understanding about the field operations (drilling, production, transportation, and lifting) of oil and gas field. 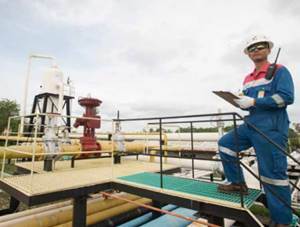 Minimum 3 years of experience in oil and gas field operations. JobsCDC.com now available on android device. Download now on Google Play here. Please be aware of recruitment fraud. The entire stage of this selection process is free of charge. PT Pertamina EP - Business Analyst, Operation Engineer Pertamina Group August 2017 will never ask for fees or upfront payments for any purposes during the recruitment process such as transportation and accommodation.